“He certainly sustained the illusion with a marvelous grace.” This is how the protagonist of “Grand Budapest Hotel”, Monsieur Gustave H., dapper, detail-oriented concierge at the hotel of the title, played by Ralph Fiennes in a performance of remarkable layers, is summarily described in regards to his position. Yet, this phrase could just as aptly describe the film’s auteur, Wes Anderson. In one way, his seventh feature film is no different than his others, quirky, over-casted, inundated with heightened set design, and stuffed full frames. But in another way, this film is his most distinct, noticeably in the way some semblance of reality keeps trying to intrude in Wes’s Land of Make Believe. That reality never quite takes over can be attributed to Anderson’s dedication to sustaining his cinematic illusions with a marvelous grace. Anderson’s films have often bore resemblance to novels, particularly “The Royal Tenenbaums”, but never quite so extravagantly as in “Grand Budapest Hotel.” The framing device features an aging author (Tom Wilkinson) in 1985 relaying the particulars of how a past work came to be at which point the film flashes back to a younger version of the author (Jude Law) in 1968 staying for a spell at the rusty relic the Grand Budapest Hotel has become where he meets Mr. Moustafa (F. Murray Abraham), the eccentric owner of the faded palace. Mr. Moustafa then relays to the author how he came into ownership of the hotel at which point the film flashes back to a younger version of Moustafa in 1932, then called Zero (Tony Revelori), a Lobby Boy at the Grand Budapest in its heyday. He is the protégé of Gustave H. and the film pivots on their friendship and the forthcoming adventure. In “Moonrise Kingdom” Anderson invented an island – New Penzance – but in “Grand Budapest Hotel” he invents a whole central European country, Zubrowka. That is also the name of a Polish vodka but Anderson shot the film throughout Germany, primarily in the state of Saxony, and most every shot here could double as a travel postcard on a rack at a ski chalet. 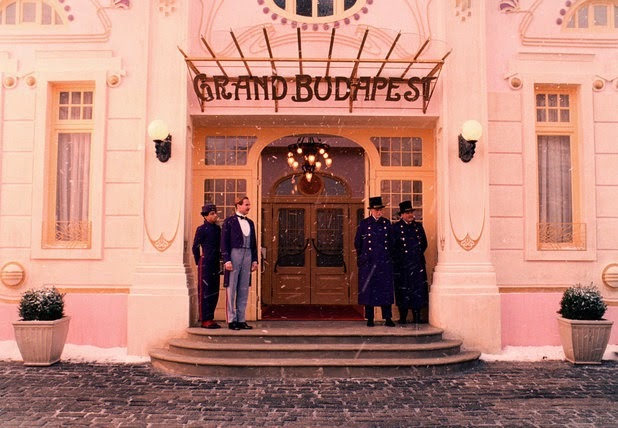 By both referencing the disrepair into which the Grand Budapest eventually falls and setting the majority of the film in 1932 Europe on the eve of WWII, Anderson is pointedly serving up a decadent slice of nostalgia, a wishful reminder of the way things were before all means of military might tore through and ravaged the landscape. Not that he denies the looming threats of terror. The approaching atrocities continually creep up around the edges of the film, insinuating themselves into the proceedings, such as in the undefined but S.S.-suggesting state police, only to be repelled by counter attacks of whimsy. This is the most violent film Anderson has made, which likely prompted the weird R rating, and while the violence is not exactly sickeningly gruesome and still artfully choreographed, it is nonetheless striking merely for existing. Willem Dafoe, in fact, stalks through the film like a European Anton Chigurh. Ostensibly the film is a kind of comic caper, centered around Monsieur Gustave H.’s relationship with an aging tycoon (Tilda Swinton). When she dies, Gustave and Zero strike out for her estate, where they learn, much to the dismay of her villainous son, the autterly Anderson-ian named Dimitri Desgoffe-und-Taxis (Adrien Brody), that she has left Gustave a priceless portrait. Alas, Gustave is accused of poisoning her, which lands him in prison which leads to a breakout and a chase and all sorts of moments and set pieces in between and after. The plot is not necessarily beside the point but atmosphere and character become the focus, even if many characters go no further than the essence of the actors playing them. Gustave, however, is something else entirely, played perfectly by Fiennes not only with droll verbal dexterity but with a noble professionalism. A significant portion of the film stretches out to other finely rendered locales and yet, the spirit of the titular establishment, as introduced and asserted by Gustave, who is literally seen at a pulpit giving sermons to his fellow hoteliers, is never left behind. Why even when he and Zero make their cross-country trek to Madam D.’s funeral, they remain outfitted in their regimental workplace uniforms. His conciliatory role as concierge is what Gustave clings to in any given situation, constantly dousing himself in L’Air de Panache, as if to ensure his appearance is always at its most pleasing. Still, Gustave is prone to excessively brief if curse-ridden hissy fits, losing his cool and instantly regaining composure, suggesting cracks in that finely-calibrated Panache-infused exterior. And this is also suggestive of the cracks manifesting in the world which both he and his dearly beloved Grand Budapest inhabit. Ultimately the hotel is an old world, pre-war symbol, memories pressed between the pages of Zero’s mind. In one sense, the film ends happily, but in another sense it very much does not. 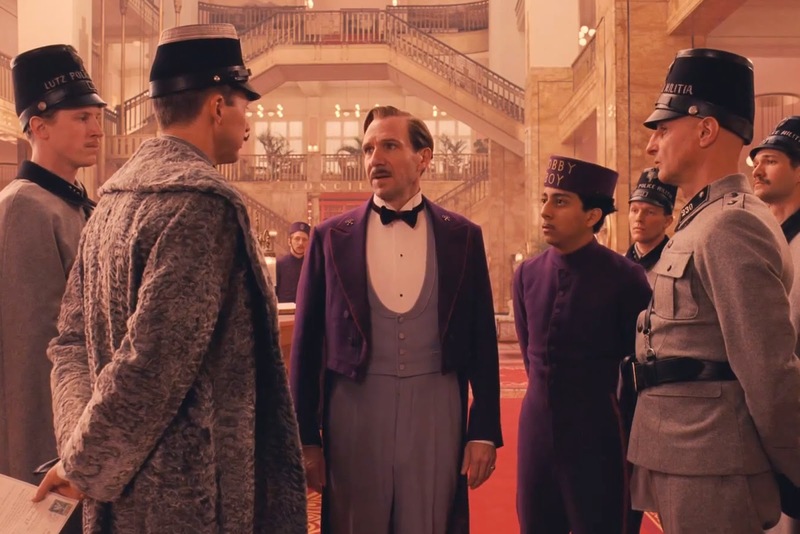 This is why Anderson opens the film by showing us what the Grand Budapest Hotel has become before showing us what it once was – he pines for the past, much like Mr. Moustafa, willingly staying in the servant’s quarters, a demonstration of painful longing. Gustave may have been adept at sustaining the illusion, but his mentor lost that skill somewhere along the way. And just past the marvelous shots and gracefully blocked set pieces of “Grand Budapest Hotel”, the first glimmer of Wes Anderson recognizing the folly of his own illusion comes into view.